This is an awsome game for all golf freaks. 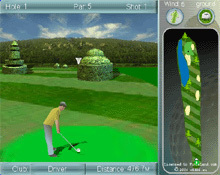 You will play a full 18-hole golf course and select the clubs appropriate for each shot. Watch out for the wind, water, bunkers etc. Are you the next Tiger?